Bake cake as needed in 9x13-inch pan. 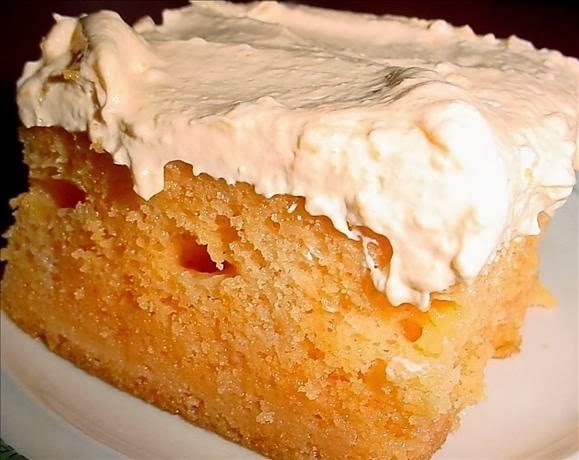 When baked and cooled, poke holes all over cake with meat fork. Mix large box of Jello with the waters and just let it start to set up. Slowly pour over the cooled cake and allow to run into holes all over cake. Chill cake until Jello is set. In large bowl, cream the cheese until creamy. Add the dry Jello powder, pudding mix, milk and the vanilla extract; beat well. Spread on cake and chill until served.